The first session is for all Service Providers (SPs). It will focus on the important changes in the DSA to come. The DSA Seal will continue to exist, but its 16 assessment guidelines are changed into 16 different guidelines, the “Common Requirements for Certification”. The context of these changes and their implications for all SP, either already DSA-certified or not yet, will be explained in this session. The second session is on the DSA Self-Assessment and peer review procedure for CESSDA SPs. This meeting is targeted at representatives of the SPs that still have to be certified. As guidance for preparing the DSA procedure the SPs will be offered the possibility of a test self- assessment in the coming months, reviewed by DSA experts. Procedure and timeline will be discussed during this session. The sessions on Friday will explain the new “Common Requirements for Certification” in more detail for everyone concerned and / or interested. Attendees are asked to bring specific issues regarding the DSA, including questions about the guidelines or their preparation of evidence and evidence statements. These guidelines have been available for comment since August 2015 and will replace the DSA and the WDS standard. We think our evidence (briefly describe) would be OK, is that right? An interactive session is envisaged focusing on a funding and cost-benefit advocacy toolkit being developed for the European CESSDA SaW project. We expect the toolkit to support the negotiation with ministries and funding organisations across Europe. The session will be of interest to archive staff with responsibility for bidding for funding or promotion and advocacy of the archive to key stakeholders. A mix of countries at different stages on the development path for social science archives (none, new/emerging, mature) are welcome. There are two sessions planned on Thursday. Both will approximately have the same content. You only have to attend one of these sessions when you are interested in this topic. No preparation in advance is needed. The sessions on this topic have two main aims: first, to start to develop the network of collaboration of Service Providers outside the current CESSDA and to collect information on the mechanisms of collaboration expected, based on a first set of suggestions introduced during the session. Secondly, to identify stakeholders and strategies for integrating new members into CESSDA, or to build a close collaboration with CESSDA. During the 2nd session of ‘Widening CESSDA’ we plan to have an interactive session to discuss the network buildings, ideas and needs issues. Creating 2-3 groups (depending the number of participants at the session) to think about the ideas regarding to network building questions related to T4.5 task. After this, we plan to hold short presentation of results of the in-depth discussion. currently outside CESSDA with regard to successful integration in CESSDA)? Opportunities seen (by the archives…)? Needs that networking between CESSDA members / non- members might help with? 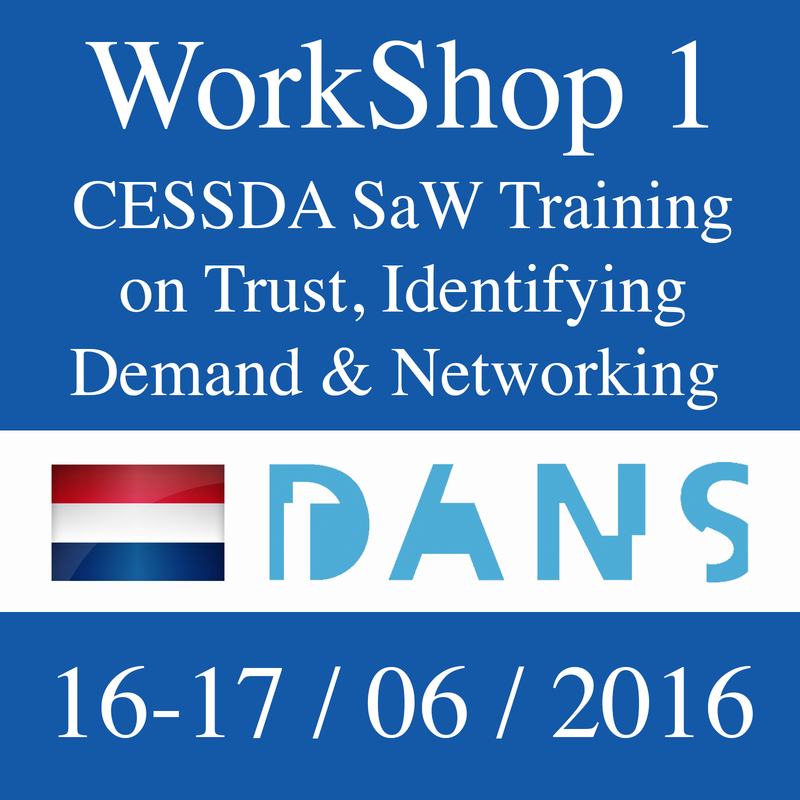 Expected / desired /realistic outcomes from the networking during CESSDA SaW / in general? * We should discuss possible formal frames of the partnership between CESSDA ERIC and non- CESSDA SPs: which type of agreements (MoU, a kind of service level agreement); how to describe the collaboration in the formal agreement; what should be included; if the plans for integration should be included into the formal agreement; what is the role of T4.5 in development of the legal framework? Parallel sessions: Friday 09.15 – 10.45 and Friday 11.00 – 12.30. These sessions are consecutive, so please attend both if you are interested in this topic. As part of the CESSDA SaW aspect of strengthening Service Providers (SPs) we are investigating how SPs and archives can support each other. As a growing community, CESSDA has considerable expertise and knowledge, but also services and tools that can be used to help other members of the community. The aim of these sessions is to discover what service providers want, and they are open to all who have a strategic understanding of the current and future plans for the services that the SP offer to their designated communities. The two sessions will: present feasible support services provision, brainstorm on strengths and weaknesses, look for commonalities, and finish with an in- depth discussion on possible solutions for some common themes. Introduction to some example services that are currently being offered and used. What are the strong characteristics of your archive? We would like you to think about at least 4 strong characteristics of your archive. What are your archives’ priorities for the near future with regard to strengthening your capabilities? What services do you provide and what might you be able to provide to other SPs?